Our story begins in 1902 with President Theodore Roosevelt. Publicly, he was known as Teddy. On a hunting expedition, Teddy Roosevelt refused to shoot a captured bear, claiming it was unsportsmanlike. Two businessmen, on opposite sides of the world, had the same brilliant idea. They would create a new toy called a teddy bear. Production began and teddy bears spread like wildfire. Children and adults alike loved them. 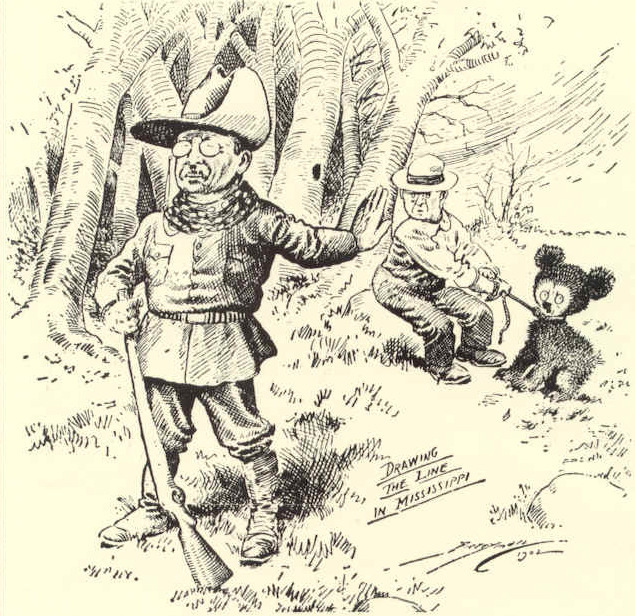 Teddy himself used a teddy bear as his mascot for his 1904 re-election. In a teddy bear factory in New York, the owner was just getting ready to close up shop. As he was about to turn off the lights, a lone teddy bear caught his eye. The bear was in the "Undesirable" pile in the dusty corner of the factory. The owner had seen the bear before; in fact, the bear had been sitting in that pile ever since production began. The lone teddy bear had a torn nose and various holes in its fur. White stuffing spilled out in a fluffy mess. The owner hesitated. He leaned against the door frame, lost in thought. When he got home, the factory owner set down his briefcase and greeted his wife. The couple's cat, Felix, had been waiting all day for him because the man frequently slipped Felix treats when his wife wasn't looking. As Felix rubbed up against the man's leg, his tail knocked over the briefcase, spilling its contents. "What's this?" the woman asked, holding up a beaten up teddy bear. "Oh, nothing." Despite the man's reply, this was not the case. The bear was indeed something. He was planning on fixing up the bear for his grandson, born the day before. As the night went on, the man went through his evening chores: reading the paper, paying bills, reviewing the factory's production numbers. He may have seemed concentrated on work, but his mind was elsewhere. His mind was on the bear. POST THE REST I CANT WAIT ANY LONGER!!!!! Haha. Patience is a virtue. Let's hear more about the rides and their history!